Trenchers can save you hours of hard labor when laying pipe underground. 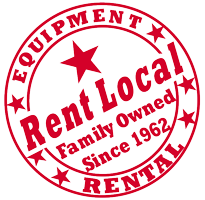 All Star Rents carries trenchers that will dig trenches up to four feet deep! This "Ground Hog" trencher is our smallest one. It has fairly limited applications because of its size. It is rated at a one foot trencher (deep) but the ground has to be fairly soft to work effectively. 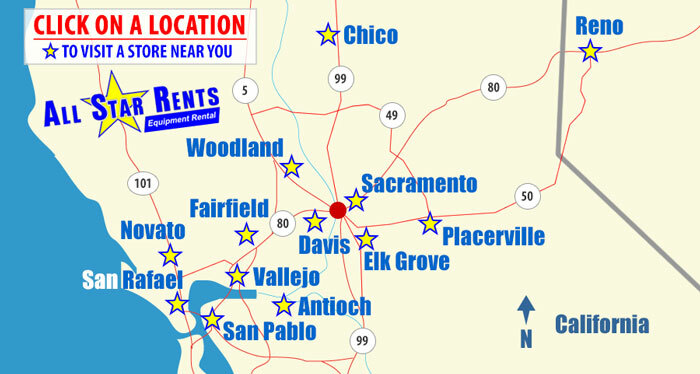 Currently this unit is only available in Davis and Woodland. We carry a hitch mounted transporter for this unit as well…or it can go in the back of a pick up or SUV. The "small Barreto" trencher also digs up to a one foot deep trench x about 3 inches wide. These units are ideal for sprinkler lines or other small gauge pipe or conduit. They are fully power driven and can go through hard packed dirt. Any size vehicle can tow this unit home…must go on a trailer...yours or ours. The standard size Barreto trencher has the ability to trench up to two feet deep x 4 inches wide. Can be used for sprinklers, French drains, electrical conduit, etc. Heavy duty – can handle hard ground. We also carry a 4 wheel drive version of this trencher at some locations for really hard ground. Any size vehicle can tow this unit home…must go on a trailer...yours or ours. Our largest trencher is the "Ditch Witch" ride on. Our standard set up has these trenchers going up to four feet deep x 6 inches wide. We have one set up to go 8" wide. These are for high volume jobs where you have hundreds of feet to trench. This requires a full size ¾ ton truck to haul…or we can deliver it! We carry the Bobcat MT-52 which is a multi-use landscape tractor that takes a trencher attachment. It goes up to 3’ deep and 4" wide. Other popular attachments: loader bucket, concrete breaker, post hole auger and pallet forks. This unit requires a ½ ton truck to transport home...or we can deliver it! When considering how wide of a trench you need please remember…pipe measurements are always indicated by "inside diameter." So a 3" pipe with ¼” thick walls is actually 3 ½” across. The speed a trencher will go is impossible to know for sure. Ground conditions including, rocks, roots, unknown objects can really affect trenching speed; as can the depth you are trenching. CALL BEFORE YOU DIG! CALL 811 or 1-800-227-2600 or visit www.usanorth.org This organization will help you identify underground hazards such as gas or electrical lines. The service is free!